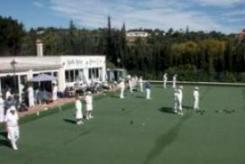 Santa Maria Bowls Club is a well established and superbly located 2 green bowling complex on Spain’s Costa del Sol, close to Marbella, situated within the magnificent grounds of Santa Maria Golf & Country Club. The club boasts an international size green of top quality Mastergreen artificial surface and a clubhouse with changing room, bar, lounge and dining room. Santa Maria hosts many of the leading tournaments on the coast. Please contact Club Manager, John Young, for more information. 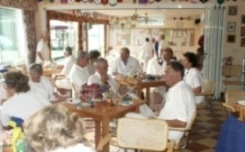 Some of the best lawn bowling facilities on the coast with club house Bar & Cafeteria open every day from 10am. Lessons are available for beginners. 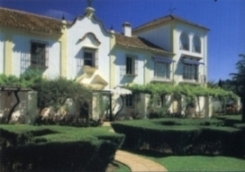 East-West: On the N340 about KM 192, travelling towards Marbella, look for the twin towers of the Don Carlos hotel and a road bridge just after the hotel. Take the exit just before the road bridge. 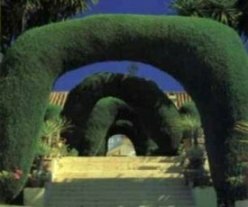 West-East: On the N340 about KM 192, travelling away from Marbella, look for the twin towers of the Don Carlos hotel and a road bridge just before the hotel. Take the exit just before the road bridge. Cross the road bridge. From the roundabout near the bridge, drive 0.3 KM to the second roundabout and take the first exit right, sign posted to the Santa Maria Golf & Country Club. Travel 0.5 KM to another roundabout. Park your car between the roundabout and the country club. (Bowlers are not allowed to park inside the country club.) Walking passed the front entrance of the country club, turn right by the tennis courts. Follow the tennis courts by turning left until you see the bowling club. 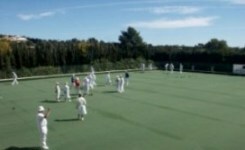 Bowls is one of Britain’s oldest sports, first recorded in the 13th century and played on thousands of greens spread across the nation, several of them hundreds of years old. In Bowled Over, bowls historian Hugh Hornby traces the history of the game and its central place in British culture – from Sir Francis Drake and Charles I to the pristine suburban clubs of 21st century Britain and the indoor greens of modern holiday camps. 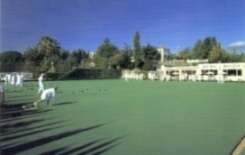 He explains how different codes of bowling have emerged since Elizabethan times in different parts of the country; for example crown green bowls in Lancashire and Yorkshire, with its undulating greens, professional competitions and gambling culture, and flat green or rink bowls in southern England and Scotland, with its measured formality and amateur ethos.